Paris might be known as the ‘City of Love’, but Rome spelled backward is love, or more appropriately to use an old Latin pun, Roma spelled backward is Amor - or love. So where better than to celebrate Valentine’s day than in the city where it all began; where we can trace this holiday all the way back to its Pagan roots almost 3000 years ago? Hint - it involves naked Romans, whips and lots of partying. Valentine’s today might be a saccharine and commercialised Hallmark holiday that has you reaching for the nearest sick-bag, but if you look back to ancient Rome it was actually a pretty wild festival. The holiday's origins lie in the pagan festival of ‘Lupercalia’, celebrated on the ides of February (so 15th rather than 14th, but don’t try and use that as an excuse if you forget). The exact origins and practices of this holiday are obscure, but what we do know is that it was a fertility festival to herald in the coming of springtime. The name ‘Lupercalia’ come from the Latin ‘Lupa’ or wolf, and so links to the wolf who suckled the twins Romulus and Remus. But enough of the origin story because this holiday had some pretty raunchy rituals. The ceremony started at the Lupercal cave in the area around the Roman Forum and Palatine hill, where there was an animal sacrifice. Then the two ‘Luperci’ (young men), were anointed with blood and milk. An elaborate feast followed, after which the Luperci would make whips from the sacrificed animal skin and run through the city naked (or near-naked) slapping the backsides of young women (who would line up to make sure they were struck). But why? Well, we aren’t quite sure, but most historians think it had something to do with fertility (If archaeologists think something was for ceremonial purposes, it’s actually a secret code for “we don’t understand”). Either way, this holiday sounds like more fun than a bunch of roses and a box of chocolates. Amazingly this loopy Lupercalia festival continued even after the legalisation of Christianity and was only abolished in the 5th Century CE. Just goes to show how much the Romans love a bit of slap ’n’ tickle. In the 3rd Century CE, Emperor Claudius Gothicus forbade his soldiers from marrying, believing that they would fight better if they didn’t have a family to think about. According to legend, the soldiers would come to Valentine who would marry them in secret. As with any good martyrdom story, Valentine is discovered and imprisoned for his crimes. 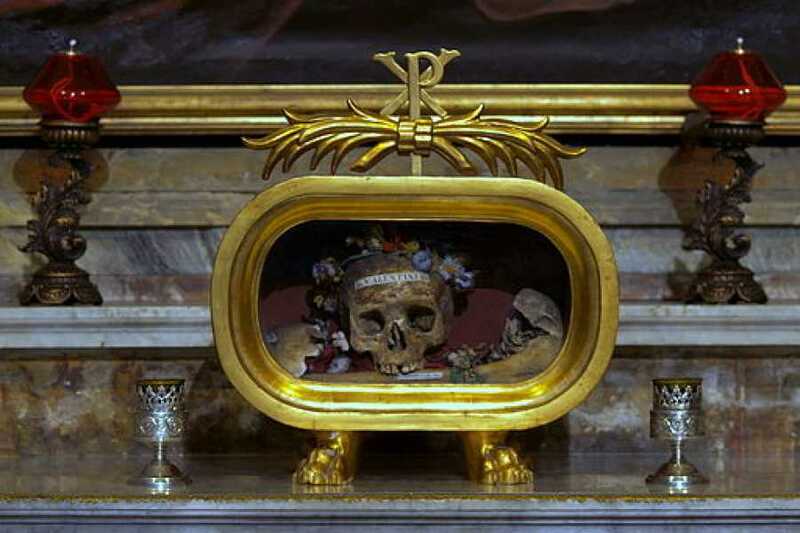 He was martyred (by beheading) on the 14th February (not exactly lucky in love) and then buried in the Christian catacombs on Via Flaminia, near the Ponte Milvio. 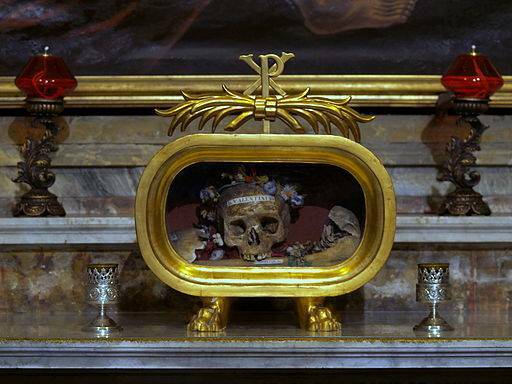 Over the centuries, the saint's relics have hopped and skipped their way around a few different Roman churches, and are now found in Santa Maria in Cosmedin. Well, his head is anyway, the rest of him was sent to Dublin (the things we will do for a sip of the black stuff). Today St. Valentine is known as the patron saint of engaged couples, love, and marriages. It seems that some of our modern symbols of Valentine's day are associated with its ancient past as well. Some have suggested that the use of red and white are actually a nod to the racy traditions of the Lupercalia, symbolising the red blood and white milk that was used during the ceremony. And what of the traditional Valentine's day card, often signed mysteriously “from your Valentine”? Well according to one tradition St. Valentine fell in love with his jailer’s daughter. He converted her to Christianity and miraculously cured her blindness. As he was being sent to his execution he handed her a farewell letter signed “from your Valentine”. Oh and the roses? Well, they are the traditional flower associated with St. Valentine, the red symbolising the blood he shed for the Church. If you are celebrating Valentine’s day in Rome you can go ahead and check out our ‘Top things to do in Rome for Valentine’s Day’ by clicking the blue link. Alternatively, you can sign up to our Best of Rome tour or our any of our Colosseum tours, where you can hear this story and more from your very own Rogue Historian.